Before the camera was turned on, we would decide only on what topic or question we would discuss. When the camera starts rolling, so does a five-minute timer. When the timer is done, we’re done. No editing after we’re done except to trim off the beginning and end. How do we make our marriage work? What are the key ingredients for us of a marriage that after ten years we haven’t even considered divorce? Why is texting and email a good thing for us? If Stacy ever murders me, where should you look for my body? So now it is up to you. Check out the video, tell us what you think and this may be something you’ll see more of in the future…or not. Loved it! My husband and I just got married this March, so any and all tips are much appreciated. Thanks! Real, short, and good info, as usual. Keep ’em coming! 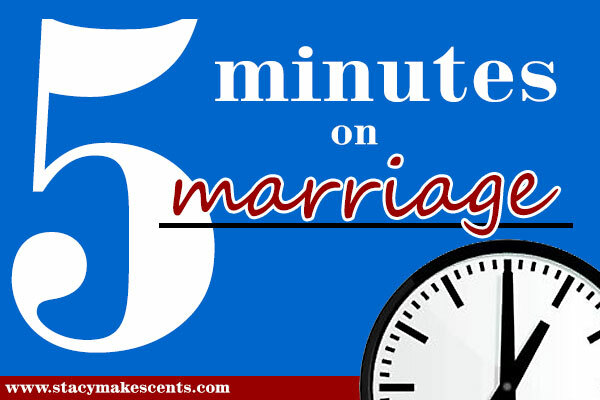 I appreciated the 5 minute video on marriage, you seemed really real together and I liked your points. I like the website as well and I have been making changes in our home for the better since I have been reading all the material I’ve looked up. Thanks and keep up the good work. Thank you! 🙂 That’s encouraging for us! I want to see more!! I follow your blog and also on Facebook. I discover more and more each day. Y’all are cute together!! Love it! You two are so cute together! 🙂 I love commenters! 🙂 Keep on! This was great! I am going on 5 years of marriage and we are expecting our first and I can use all the wisdom and advice I can get. I appreciate your honesty and candor and look forward to more. Thanks! Thank you, it was wonderful; please continue. We hope to post again soon! I love your blog- and this one was great! Thanks for sharing about your marriage, there’s something refreshing about finding people who aren’t afraid of being open and honest on things that matter. Loved the video and look forward to more! Loved it! The girls loved watching it as well…Maggie was talking back to you! 😉 Can’t wait to see more. You need a 5 Minutes on THM! 🙂 Good. We’ll do another one soon! First visit to your blog….I’m a new fan! I loved the candid discussion. 🙂 Thanks! I hope you’ll come back! I found you about a year ago. You have been a blessing to me. I love how you guys do your blog. I have read some others but yours is my fav. So real and very easy to connect with. Thank you! I have really liked hearing (reading) Barry posts. I enjoy the male perspective. I would like to know more about how you divide home chores if at all– also, my daughter just turned 5 and is highly emotional. Her high emotions have led to an increase in fussing/whinny/ and tantrum behaviors –we are lost on how to train self control and emotional health.. My hubby and I both shut down and leave situations that cause us to have emotional rises. Have you had issues with Annie?? Annie has always been “high needs.” 🙂 We just kinda feel like that’s normal. When she gets too crazy, we make her go to her room and sit on her bed until she calms down. Then we start over. That usually works. Or other distractions. Something totally different than what she was doing before. Y’all are so funny! I like sitting down with the both of you. 🙂 thanks for sharing! 🙂 It’s better in person. great!! good laugh! we have some things to learn, and yes mentors are very important! to help us practically and help us to turn to the Lord. Loved it!! Please make more videos! I thought your video was great. The “noise” from the baby was not distracting. You are a family with young children. If you have to take the time to make sure that everything is “perfect” before shooting the video, they won’t be spontaneous and fun. If you have to wait for peace and quiet before making your video, you will never make another video. Just keep making them and don’t worry about a little noise! Peace and quiet…what’s that? LOL Thanks, Tina! Barry is full of them…or it. Full of it. Yeah, it. So far Andy’s noise was distracting to some…so I’m not sure they could handle Annie here too. 🙂 LOL She’s quite a bit louder than him. That’s why we made this video when she wasn’t here…incognito. LOL Oh dear. I kinda feel like part of our “real life” is that our kids are with us. But we’ll try to do something different next time. 🙂 I”m so glad you enjoyed it! You called me cute – I like you! 🙂 We had to take the opportunity to do one when Annie wasn’t here – and Andy’s naps are while Barry is at work. You too! Congratulations on your anniversary coming up! 5 years is a great accomplishment!! We’ll do more for sure! Why yes I am the cut up of the family. 🙂 Could ya tell? 🙂 We’re full of it. Thanks for the support! 🙂 This was our first try, so we didn’t know. Next time I”ll try Andy in a different room and see if he’s happy there. Y’all might hear some squalling. Could you put Andy farther behind the camera? I know how babies like to be with parents. OR could you even hold him? Just some ideas…..hate to make Andy upset, just for us! Loved it! I say make more! I would love to see your whole family, if you are not opposed. Not sure what I would want you to talk about. I just loved seeing you guys! LOL I hope he will! Mentors are soooooooooooooooo important. I tell newly married couples to just find couples at church that are doing it right and hang out with them until they are sick of you 🙂 Same with parenting. My husband and I knew NOTHING about parenting so we read all the books and that made it worse. Hang out with Godly married couples and Godly parents. Your church family IS your family and they teach you. We’ve been married 20 years and now we are the mentors 🙂 I enjoyed your video, btw. I will have to read your blog with a southern accent from NOW ON!! I am so thankful for our mentors – they have really made a difference in our life: as parents and as a couple. This was great! I would enjoy more video’s. Great! 🙂 Thanks for letting us know! I love it! I think you should answer reader questions during this time. Unprepared, unscripted. Someone just reads you the question. You guys are a great team!!! That’s a good idea. 🙂 I’ll see if people will submit some. This was great! You didn’t mention if you had marriage counseling before you got married to discuss if you had similar ideals on money/kids/etc & how you handle disagreements on money (since that’s the #1 reason for divorces). Maybe another 5 min topic! I also love the idea of marriage mentoring! I think it was fantastic. Very real, very natural which is always good to see. The only thing I would alter is the noise level near the mic. It drowned out your words on occasion, though Annie is fantastic at keeping a beat. I loved your video!! You two are just too precious. Keep on doing what you are doing. Stacy, I bet you are the cut up in the family. I think it would be a great idea if you write down or record everything cute and funny thing that Annie and Andy do. This would be a terrific book or blog in itself. The kids would love these memories later on when they have their own. Love you both! Who does what chores around the house and why? what chores do you hate and who (if either of you) gives in and does this or that for the good of the whole. etc. Do you ever play games with each other? What do you do as a couple or family that brings you closer, makes good memories and is or isn’t in the budget? etc. It’s always fun for others to see that it’s not always easy to make it work (why it’s called work) but in the end it can work and is worth it. Thanks for sharing. I LIKE it! Keep ’em coming! Bahahaha! Making up IS fun! Thank you for that, I thought it was fun! (: My husband and I got married while I was 18 and he was 21, going on our 5 year anniversary this December with everyone along the way sharing their opinion of how it won’t work. Divorce is not an option for us, either. Communication is a huge thing for us, especially since he works out of town. I like the points you touched on and it’s always nice to see how other couples work in their marriages. (: Have a good weekend! Love it! Definitely make more of these little videos. Next time do this when it is nap time. Otherwise, I like all you said. Loved it!! You two are so cute together and everything you said was excellent and so true. Love it – great advice!!! HA! HA! Yes, would like to see more! Good advice with humor….having been married for 33+ years this advice is ‘spot-on’….plus a whole lot more…but you have the basics “down pat”! Great post! Very real. Thanks! I love this! Just shared it with my Husband. Ya’ll are cute & quirky…and just plain real! 🙂 Thanks for sharing your hearts on marriage. How appropriate as my husband and I are celebrating 22 years together…. today! Good points. We do the same thing with divorce not being an option. Equally yoked would be an addition.